This food was designed to suit the occupants of classic community tanks. With 30 different ingredients, these fine granules are highly acceptable to fish of various sizes. 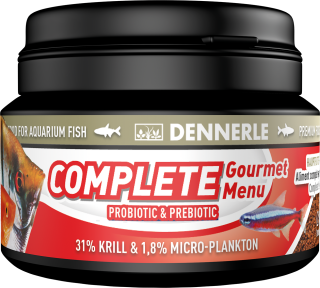 60% of this food consists of natural crustaceans and molluscs, 4% is natural algae. This is the first fish food to use the leaves of the "wonder tree" Moringa olifera, with its high proportions of trace elements and vitamins.